Doctor Who is the longest running science fiction television show in the world! 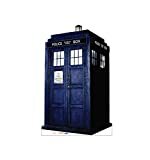 If you are a big fan of the show, you will find a great selection of unique Doctor Who gifts here. Doctor Who is a very popular science fiction television show. It follows the adventures of a time-traveling humanoid alien known as the Doctor. The Doctor flies through space and time in a time machine named Tardis. This show has the honor of being listed in Guinness World Records as the longest-running science fiction television show in the world! With such a large following, there are always people looking for Doctor Who gifts and merchandise. That is where this page comes in. 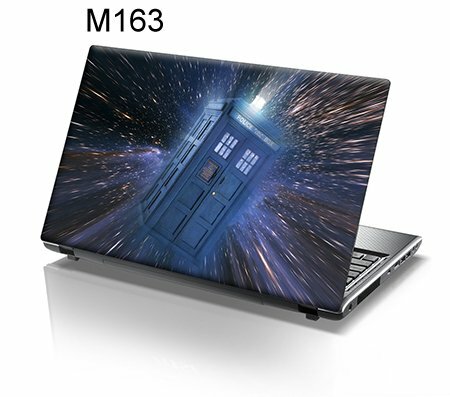 I have searched the Internet to find the most unique Doctor Who gifts available and have featured them all on this page. 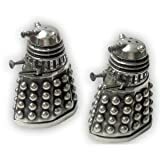 From home and bedroom decor accessories to toys and electronics, this page has all of the must have Doctor Who gifts currently on the market. There are many Doctor Who room accessories available. The first is the Doctor Who duvet bedding set. This twin bedding set features flying Tardis, Daleks and more. It is 50% cotton and 50% polyester. The next item is a reversible, talking wastebasket bin. The Doctor Who iimages include flying Tardis and Dalek. Everytime trash is tossed into the bin, one of three popular Doctor Who sounds is played including "Exterminate!" and "You are an enemy of the Daleks". 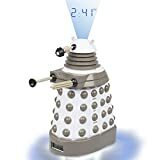 The last bedroom decor item is the Dalek Projection Alarm Clock. This unique clock projects the time and shouts "Exterminate!" to get you out of bed each morning. How cool is that? You will be the envy of all of your friends once they see your out of this world Doctor Who room! Grab yourself a cookie or have a drink of coffee Doctor Who style! There are two unique Doctor Who cookie jars on the market. The first is the Tardis cookie jar. This cookie jar features light and sound effects by opening or closing the lid. The other cookie jar is the hard to find Darvos, creator of the Daleks. This ceramic, limited edition cookie jar stands 14" high. 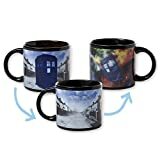 The Disappearing Tardis mug would make a great addition to your kitchen decor. This unique mug features an image of Tardis. Once hot liquid is added into the mug, Tardis disappears into space and time to get ready for his next mission. There two other Doctor Who mugs for your collection. The first is the Doctor Who Tardis Mug. This novelty mug is designed as an exact replica of Tardis that landed in London in 1963 and has a 16 oz capacity. The other Doctor Who Mug features an image of Doctor Who and the flying Tardis. These unique Doctor Who cookie jars and coffee mugs will look wonderful in your kitchen decor and will make everyday tasks a bit more exciting. Plus, you can have fun showing these goodies off to all of your friends! Bring Your Favorite Doctor Who Characters To Life! 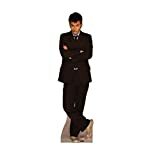 There is a large selection of life-sized Doctor Who cardboard stand ups to choose from. Some of the characters include Doctor Who, Dalek, Tardis, Davros, the Silurians, K-9, Cyberleader, Jack Harkness, Donna Noble, Rose Tyler, Martha Jones, Sarah Jane Smith, Amy Pond, The Silent and more. These cardboard standees would look wonderful in your bedroom or TV/game room. There is an extensive line of Doctor Who toys and games on the market. I have selected three of my favorites to feature here. The first is the lenticular animated chess game. This game features 32 highly detailed Doctor Who character chess pieces. The animated print technology helps to bring these beloved Doctor Who heros and villians to life. Puzzleballs are just wonderful! That is why I was thrilled to see there was a Doctor Who puzzleball available. This 108 piece puzzle from Ravensburger includes several of the Doctor's deadliest adversaries including The Daleks, The Silurians, Vampires, Cybermen and The Weeping Angels. The spinning Tardis toy will keep you entertained for hours! With enough practice you can learn to levitate Tardis so that it actually floats mid-air. This is your chance to be the Doctor and guide him and Amy Pond on a thrilling new adventure. 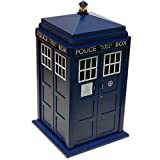 The Doctor Who USB hub is a replica of the 1950s Police phonebox Tardis from the television show . A flashing lantern on the roof and time traveling sounds are activiated when the device is plugged into the port. This USB hub will look fantastic on your home or office desk. The next unique Doctor Who gadget is the Dalek Molder money bank. This bank measures 8" high and features a coin slot in the head of the Dalek. Saving your coins has never been more fun! Ive been looking for a bedding set and always get the currently unavailable message. Can amyone help me find a bedding set of doctor who? Please?!! 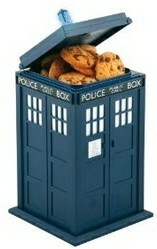 I love that Davros cookie jar - what fun! What Happened to the Waltons After The Waltons Finished? We're going to have to assume that the Walton family lived happily ever after. This Wizzley article is all about the actors who played them! The tales from Walton's Mountain invoke an age of innocence; though naturally we're talking about the fictional family, not the actors who played them!